Energy teachers are educators of a different kind. I am blessed to have three great energy teachers whose contribution to my growth is immeasurable. They taught me about the universal life force or spiritual healing energy that many call Reiki. I briefly acknowledge their contributions in my book, Light on Reiki and Neo-African Mysticism. 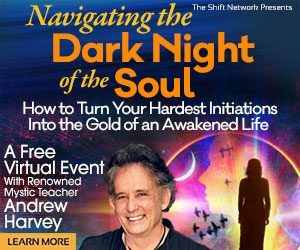 Over the next three days, God-willing, I’ll share my joy and gratitude that I’ve had the best healing-energy teachers in greater detail than I do in the book. In late 2006, Sister Nurah and I were destined to meet. A mutual friend forwarded my email regarding a planetary change to her, and we began conversing through cyberspace. At the time, I really didn’t know what Sister Nurah was talking about. She was the first person I ever heard speak about energy and being a healer as if they were the most natural things in the world. She explained that she was a Reiki teacher and I shared that I’d heard of Reiki but had never met someone like her. And so our relationship began. It was obvious I was to learn Reiki from her. She was as quirky as I was and 10 years older, so I knew was a special opportunity. She taught and I learned Reiki 1 and Reiki 2 with a few other women at her home. I soon joined the International Reiki Association and did a lot of research on my own. Where this training would lead, I really didn’t know. Yet I did know that my fragile emotional health as well as growing knee pain needed to be addressed. They were. Sister Nurah played a pivotal role in my adjustment to heeding the promptings of my Higher or True Self. We did not always agree and now I realize that she and her teaching style were expressly chosen by the Creator to handle my left-brain resistance. I needed more work than I was willing to admit. She often saw through me and I often denied what she saw. I struggled with what was coming up from inside of me, and with her for seeing so clearly where I was and needed to be. Psychologists often state that when you wrestle with someone, you are really wrestling with the aspect of yourself that you see in another. She and I wrestled and we overcame as we grew. I can say that my life today would not be the same if we had not met. In fact, I cannot imagine what my life would look like if I had not met her. Now I am teaching Reiki somewhat like Sister Nurah taught me, and experiencing the joy of seeing people grow and blossom despite experiencing growing pains while doing so. I give thanks for Sister Nurah Brenda Johnson being a Light in my life. I fully appreciate why she was chosen to be my first Reiki teacher. 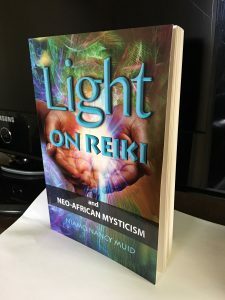 Buy the digital version of my book, Light on Reiki and Neo-African Mysticism by sending $6.95 to the HealMobile account at Paypal. See details here. 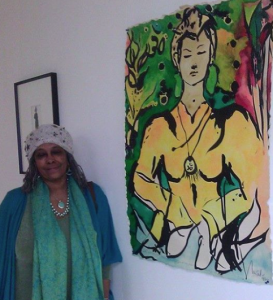 Photo Credit: Reiki Master Teacher Nurah Brenda Johnson standing next to a painting by Miah Leslie, her daughter. Photo courtesy Miah Leslie.